I have had a number of enquiries on how to support the Allied troops in the Iraq War and so this page is to show support for them. If you would like to send in an email to Alastair he'll post it up on this page. Of course being as we're a Scottish site we'll naturally focus some editorial on our own Scottish troops. Do also see the Stand Up for America pages in the Family Tree. Just to let our troops know that we believe that you are doing a great job in a very difficult situation. It's not the politicians who are out there and we support YOU! Hundreds of people lined the streets of a Scottish town to pay their respects to a soldier killed in Iraq. The 31-year-old's funeral took place on Tuesday at St John's Church in Perth and was attended by more than 1,000 people. 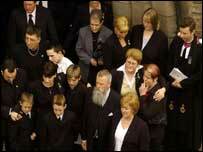 Soldiers of The Black Watch joined Lance Corporal Stephen's family and friends to say their final goodbyes. A lone regimental piper played a lament as mourners arrived for the service. The soldier died saving colleagues during a military attack near Al Zubayr in southern Iraq on 24 March. Shops and businesses near the church were closed as a mark of respect, and local roads had been closed the previous evening. Invited dignitaries included Perth MP Annabel Ewing, Perth MSP candidate Roseanna Cunningham, and Perth and Kinross Provost Michael O'Malley. The family party arrived in a fleet of limousines at 1230BST, and Lance Corporal Stephen's widow, Shirley, was greeted by minister the Rev David Ogston. Some members of the party brushed tears from their eyes as they entered the church amid the silence of the square around them. The service, with readings and prayers, was relayed to the crowd outside by a public address system. Many people listened with heads bowed and hands folded in front of them. 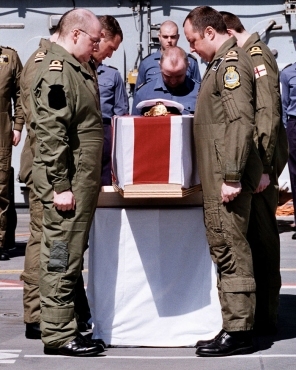 The soldier's body was returned to the UK on 8 April, arriving at RAF Brize Norton with the bodies of 10 other military personnel. Lance Corporal Stephen, from Scone, joined the 1st Battalion of the Black Watch in 1997 and served in Northern Ireland, Germany and Britain. He went on to become part of the regimental recruiting team before rejoining the mortar platoon, normally based in Germany, last year. In the funeral address the Rev Neil Gardner, former chaplain to the Black Watch, spoke of Lance Corporal Stephen belonging to two families - the regiment and also his kin - who both mourned his loss. After the 45-minute service, the soldier's coffin emerged from the arched doors of the church. 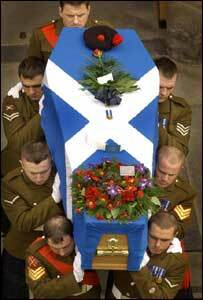 Held aloft by six regimental pallbearers, the coffin was draped in the blue and white colours of the Saltire flag, unusual for a British soldier. The request was made by the family to use the Scottish flag as a opposed to the Union flag. The coffin was borne a short distance to the waiting hearse to the strains of the piper's lament Flowers of the Forest. I am proud to be an American ancestor of a member of the Black Watch, you are doing a great job in the support of freedom. I have been watching "Fox News Channel" with interest and have followed the engagements of the Black Watch. The Regiment is in my prayers. Keep up the good work, a proud Scottish/American. UMM QASR, Iraq (AP) - Striking before dawn, British tanks and infantry staged a lightning raid into besieged Basra on Saturday, destroying five Iraqi tanks and blowing up two statues of Saddam Hussein before withdrawing without casualties. The strike was the first thrust into the city confirmed by British officers, and it and other limited attacks around Basra could be a preview of how coalition commanders might deal with a siege of Baghdad. The move also was further evidence that British troops fighting for control of Iraq's far south are not here just as window dressing in the war to topple Saddam. The 30,000 British soldiers and marines in the field have pedigrees that stretch to El Alamein, Waterloo and earlier and aren't taking a back seat to an American ground force about five times larger. 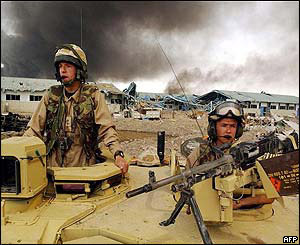 British troops have fought some of the toughest battles so far, mixing up pinpoint raids in urban areas with the pummeling of Iraqi armored forces daring or desperate enough to risk a head-on fight in the open. On Thursday, 12 Challenger tanks from the Royal Scots Dragoon Guards battled an equal-sized force of Iraqi T-55s near Basra, Iraq's second-biggest city where 1,000 or so Saddam loyalists are holed up among 1.5 million people widely unfriendly to the regime. The Iraqi force lost two tanks and saw two infantry positions overrun. In an army that thrives on obscure regimental histories and traditions, the Scots Dragoon Guards have one of the proudest, wearing beret badges resembling the eagle standard of Napoleon's army, which they engaged in a suicidal cavalry charge at Waterloo in 1815. Having long ago given up their gray war horses and sabers, they now fight from Challenger II tanks, using some of the most sophisticated aiming systems in the world to hit the aging Iraqi tanks while moving at 40 mph. 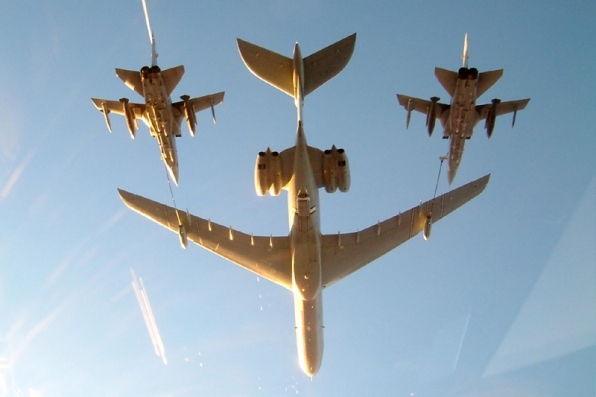 Overhead, the Royal Air Force has been flying about 10 percent of the 1,000-plus sorties flown by the coalition each day, employing their own aerial refueling aircraft, Tornado fighter-bombers and Harrier jump jets. Asked if the British, who are operating under overall control of U.S. Marine Lt. Gen. James Conway, would need reinforcements to take and hold the south, one of their officers bristled. "We've got quite enough troops to do the job, 26,000 troops," Col. Chris Vernon, the army spokesman in Kuwait City, told journalists. "The British army is a professional army that's probably second technologically only to the Americans." U.S. Marines and Royal Marines surged into the Faw peninsula at the outset of the war. Though they would have preferred to avoid urban fighting, they needed to seize Umm Qasr, Iraq's main deep-water port, as soon as possible to open it up for ships bringing in humanitarian aid. The city was taken after five days of hard street-to-street fighting. Iraqi militiamen sniped from windows, while others feigned surrender, then opened fire when troops came up to take them into custody. Military officers say the area is largely secure now, and the harbor is being cleared of mines. British troops patrol the dusty streets, walking in pairs on both sides of the street, a sight familiar from the days of urban guerrilla warfare in Northern Ireland. Gurkhas, armed with assault rifles and their intimidating 13-inch kukri knives, help guard the port. The most powerful British unit, the 7th Armored Brigade, has been at the gates of Basra since midweek. Its soldiers are staging quick, sharp attacks on Iraqi forces that took refuge in the city and reportedly have attacked civilians trying to escape. The brigade is descended from the "Desert Rats" that defeated Nazi Germany's Desert Fox, Field Marshal Erwin Rommel, in the North African desert in World War II. 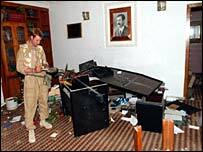 On Tuesday, soldiers from the brigade raided the house of a senior official of Saddam's ruling Baath party on the outskirts of the city and took him prisoner, leaving 20 dead bodyguards. "He was sitting there in his little building, thinking what a good morning, when whap! we're in, whap! we're out, and 20 of them are gone," Vernon said. "That would have sent a shock wave through them." British forces are targeted by Iraqi artillery in the city center, but officers said they limit their retaliatory fire, shooting only at military targets they can see to avoid inflicting civilian casualties. "We will play it as we see it, on our terms, seizing opportunities tactically as we see it," Vernon said. He refused to give a figure on how many Iraqis had been killed so far. U.S. military officials also do not give hard figures. "A war-fighting army does not go along adding up how many people it kills," Vernon said. "It kills them, it buries them, and it takes prisoners of war." Hi wish all you guys my thanks for being there take care and come home safe. God be with you. I am a proud American and wish to extend my thoughts & thanks to all the troops who are out there fighting. I realize you are putting your lives on the line for us. I send a very heartfelt wish for your safe return to your home soils. 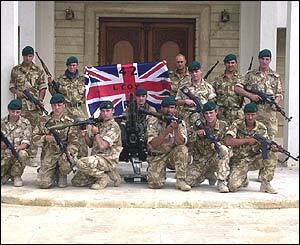 My family and I are proud of you all, keep up the good work and hope you all return home safely soon. I am the Officer Commanding an Army cadet Detachment, and I am aware that there are 4 ex Cadets from my Unit fighting in Iraq, I will not mention their names or Units, but I will say this; Hello Lads Colour Sergeant Wright here from No 8 Det; remember everything you've been trained in, keep safe and come in and see us when you come home, every one of you are in our thoughts and we are proud of you all. NEAR BASRA, Iraq — The sniper takes two deep breaths, squinting down the sights of his custom rifle. Just over 750 yards away, a gunman climbs into the rear of a pickup. British snipers on Iraqi guerrillas: "You don't think of them as people. They are just armed enemy militia who have to be taken out." Through the cross hairs, Lance Cpl. Vincent Polus of Inverness, Scotland, can see the Kalashnikov assault weapon and ammunition pouches strapped to the enemy soldier's belt. Holding the second breath, Polus takes up trigger pressure, aiming slightly ahead of his target's chest as the pickup begins to move. 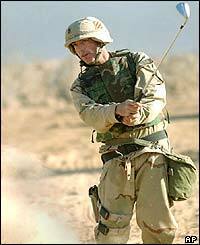 He squeezes off a round. The 7.62mm bullet, traveling 3,000 feet a second, hurls the Iraqi backward, a fatal blow. It is Polus' third confirmed kill in a week that has seen Scotland's Black Watch sniper section pick off 18 armed guerrillas in Az Zubayr, the nerve center of behind-the-lines resistance in the British sector of southern Iraq. British forces are carrying the action to the paramilitary Fedayeen Saddam in their own backyard. Armed with weapons that can deliver a fatal head shot at 1,000 yards, the battle for the back streets is turning in British snipers' favor through patience and keen observation. "Our job can be frustrating," Polus said. "You can lie up for hours or days in an observation post. You can see targets beyond your range. You can see targets which are off-limits because they're in someone else's patch or because they are too close to innocent civilians. "When we manage to slot guys we know have been targeting our men, there's a certain satisfaction to the job. You don't think of them as people. They are just armed enemy militia who have to be taken out." The Black Watch snipers are doing their work as part of a British operation that has engaged Iraqi paramilitary soldiers loyal to Saddam Hussein outside of Basra, Iraq's second-largest city, for several days. The city is the heart of the country's southern oil facilities, and its population of 1.5 million is mostly Shiite Muslim. Many oppose Saddam's Sunni Muslim regime, but the city remains under control of his ruling Baath Party militia. Six days ago, four other Black Watch snipers carried out an operation likely to earn at least two of them decorations for gallantry. As they traveled into town, a nearby tank reported seeing four militiamen carrying rifles and rocket-propelled grenades. 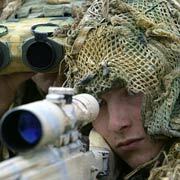 The sniper teams, consisting of a shooter and a spotter with a powerful scope, located their targets 800 yards away. Lance Cpl. Scott Robertson's first shot dropped one of the four. The other three dragged the body into nearby bushes and sprinted for houses a few yards away. The sniper teams, equipped only with bolt-action rifles meant for long range work and a single automatic weapon, also headed for the house. Cpl. "Pedro" Laing kicked in the door to find himself confronted by an elderly man just as one of the fugitives hurled a grenade over his head. It exploded outside, peppering Robertson with shrapnel. The enemy soldiers fired automatic weapons and a rocket-propelled grenade that detonated on a bank outside. Cpl. Mark Harvey jumped from the grenade with a backward somersault, crushing one of his vertebrae. Despite the agony, he got to his feet and shot the Iraqi militiaman. Laing and Robertson then threw four grenades into the room. Four soldiers from the Black Watch mortar platoon arrived, entered the building and finished off the remaining enemy. Sgt. Mark Cameron said: "It's like the movie Black Hawk Down in Az Zubayr. But the fact that we are fighting in an urban environment allows our guys to do what they are trained for. In a purely desert war, we would have been struggling." JUST 20 infantrymen of Scotland's elite regiment The Black Watch spearheaded a stunning British blitz on Basra. On a night of stunning victories across several fronts, the daring Scots crept into the city under cover of darkness. They evaded hundreds of fanatical Iraqi militia to DESTROY five T55 tanks with handheld Milan missiles and WRECK more than five mortar positions. A propaganda TV station was BLASTED and a bunker sheltering a paramilitary death squad was BLOWN UP. During other actions around Iraq's second city in a night of British glory, 320 senior Ba'ath party militia were KILLED and 300 Iraqis taken PRISONER. Many of the actions involved targeting by SAS and SBS men. 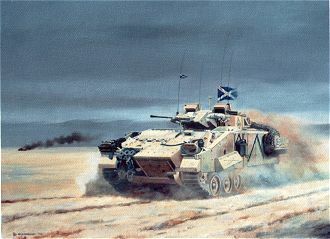 And as a parting shot eleven Challenger II tanks of the Scots Dragoon Guards entered the city, defying rocket-propelled grenades bursting on their armoured sides. 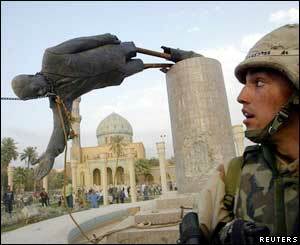 The Desert Rats attacked three targets—and symbolically toppled two Saddam Hussein statues, one a 15ft monstrosity made of cast iron. Tank commander David Ross, whose Challenger II destroyed the iron statue with one shell, said: "It just sort of crumpled, there was a big flash and sparks, and it disappeared. I wish it was the real thing." There were NO British casualties and it is believed not one civilian was killed. The Black Watch have been in every major British conflict for 278 years, winning 169 Battle Honours, six VCs—and instilling fear into all their enemies. I am a red blooded U.S. citizen just wanting to find a way to thank all of the U.K. support you have given in this great cause to bring freedom to an oppressed people. Your country has shown a legacy of stauch toughness that has stood up against all odds when other neighbors around your were following like dominos. I appreciate your tough as nails mentality from all away the pond here in the U.S., whatever service person who reads this, please let us know we are cheering for ALL of you, not just one country, BUT ALL who have the resolve to make this world a safer place. God Bless. Thank You for the opportunity you've given us to voice our support for our brothers and sisters in your services. Our family is very proud of our Scottish and British heritage and we are extremely proud to be able to embrace and thank you all for the steps you have taken with us for the world's freedom. We are praying for everyones safety and return and are blessed with the freedom to be able to do so. As an American of Scottish heritage, I would like to extend my heart felt thanks to our Scottish and UK friends for standing by us in this war. I wish all God speed in their mission. A Scottish mother with a son serving in Iraq has asked people to lay daffodils at war memorials in support of troops in the Gulf. The Flowers for our Forces campaign is aimed at boosting the morale of families worried about the war. The idea comes from Louise Bennet, from Strathblane near Glasgow, who has a 23-year-old son in the Royal Marines. 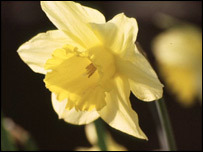 Mrs Bennet said she would like to cheer people up with a spring-like show of colour, with daffodils, pansies or other yellow flowers. "The idea really was to show a force of strength, as a moral boost for our forces abroad," she said. "It is also to strengthen the morale of our mums and wives and girlfriends back home because we're all going through a very difficult time at the moment and a very emotional time." Marjorie Peddie's son-in-law is serving with the 7th Armoured Brigade. "There's a war memorial in almost every village in the country and it's a focal point for people to take their flowers and express their support for the forces," she told the BBC's Good Morning Scotland programme. "It's the families who we are trying to help, they are going through a very, very difficult time, waiting to hear news, many of whom haven't heard anything for three weeks." Mrs Bennet said the campaign grew initially from a personal show of respect. "It was my birthday a couple of weeks ago and I was given a lot of spring flowers and my thoughts were just with my son that day. "I just wanted to take my yellow flowers down to my local memorial and remember what our past soldiers have done for us and what our present soldiers are doing for us and just remember the wives, mums and girlfriends and also the people of Iraq." Flowers for our Forces hope the idea will help people understand what families are going through as the war unfolds. My son is fighting out there at the moment. He's a medic attached to the Royal Scots. His last letter said that they were moving up and all callsigns were turning towards Baghdad. 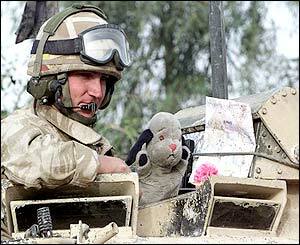 I've told him to keep his spirits up and his head down....................We're proud of all the troops. A message from Canada, I'm sorry our government has been incapable of making the right decision, my thoughts are with you. 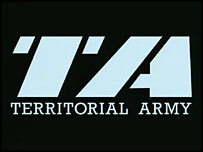 The war in Iraq has led to compulsory mobalisation of hundreds of reservists from the Territorial Army (TA) in Scotland. It is the first time it has happened since the Suez crisis in the 1950s. The war has also led to a steady increase in people wanting to join the forces. More than 300 part-time soldiers from the Territorial Army in Scotland have gone to war. PEACE through STRENGTH. May God bless all of you. I am an American of Scottish heritage (through my mother's family), a descendant of Scottish soldiers and settlers who came to this country before the American Revolution and carved a home for themselves through their hard work, determination and fighting spirit. My Scottish ancestors have stood up and fought for what they believed in for over 200 years both in this country and in yours (I also have connections into the Highland Light Infantry regiment from Glasgow). Currently, I have a cousin serving in the British Army. At last we heard, he was in Kuwait. So you see, the tradition continues. I am 100% behind both our governments in their decision to take care of this problem in Iraq. It seems like it is only the British and American governments who have the guts to stand up and make a difficult decision when circumstances call for it. Thank you for once again standing alongside of the American government and her army, as you have done on so many occasions in the past. I am proud to be a descendant of the best soldiers in the world. Keep yourselves safe and know that this American is thanking you for your contribution to the war. The commander of the Black Watch battle group has said he is ready to advance and capture Basra, but needs the authority from the US High Command before he can proceed. Lieutenant Colonel Michael Riddell-Webster, 42, speaking a few miles south of Iraq's second city, said the final push would need at least a brigade. The timing of a final attack, he said, would depend on intelligence estimates about the level of resistance and the progress made by US forces now on the outskirts of Baghdad. "I personally think this battle group could go and do Basra now," he said. "But we are a small cog in a very large military machine under US control. "We also do not want another Stalingrad. The overriding priority is to avoid unnecessary civilian deaths and a street-by-street slogging match." Reflecting on the Black Watch's part in the campaign so far, Colonel Riddell-Webster said his personal feelings were "a pot pourri" of excitement, exhilaration, sadness and tragedy. "We have achieved all we expected and more, but sadly, not without paying a price. One always hopes that will not be the case, but it is war and casualties are inevitable. "The high point was seizing control of the town of al-Zubayr, sensing it was ripe to go and pushing in a company to take it. "The low point was the night we lost a good man to a rocket propelled grenade ambush and then had a friendly fire incident, which killed two more. I didn't think it could get any worse. "You just have to take a deep breath and crack on. There is nothing else you can do. When the tragic reports came in, we were just about to launch an offensive raid. In retrospect, that was probably a good thing. "None of us has done this before. Events are now proving that the old adage of war consisting of 99% waiting around and 1% high octane experience is right on the ball." The colonel will have been 20 years with the regiment in five day's time. Originally from Coupar, Angus, he is married with two children. JACQUES Chirac extended a diplomatic olive branch to Britain yesterday with a letter of apology to the Queen. The French president expressed regret over the desecration of a British war cemetery on the Channel coast and insisted the French had not forgotten the debt they owed British soldiers who died liberating their country. In a letter to the Queen, Mr Chirac described the scrawling of anti-war graffiti on monuments at a first world war cemetery in Etaples, near Calais, as "inadmissible and shameful". Vandals spraypainted anti-war slogans and insults against Tony Blair and President George Bush at the cemetery. It contains the remains of 11,000 British and other allied soldiers. The graffiti was discovered by British tourists. Mr Chirac also said French people's thoughts were with British soldiers currently fighting in Iraq. "From the French people and from me personally, I offer you my deepest regrets," he wrote. Mr Blair's official spokesman said: "We unreservedly welcome both the content and the sentiment of President Chirac's letter and the sentiments towards our troops serving in action at the moment and that his thoughts and the thoughts of the people of France are with those soldiers." The letter marks a concerted attempt by France to heal the diplomatic rift with Britain and America over the war in Iraq. Mr Chirac does not want the issue to ruin France's relationship with the US or the UK. I want to send a personal note of Thanks to all of you for the job you're doing in keeping freedom "free." I served in the US Forces in Great Britain during the 60's and 70's and I feel a great kinship with you. Being of Scotch-Irish descent, I value your support of US Forces in Iraq, and pray for each and everyone of you to be able to return home safely to your loved ones soon. 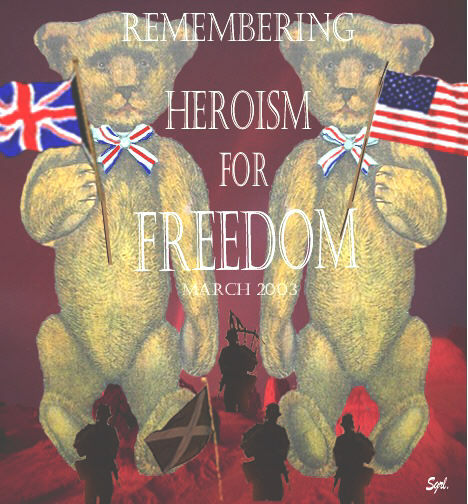 Being an American of Scottish decent I would like to say Thank You to all the brave Scotsmen and British who are fighting with Americans for freedom for an oppressed country. You are all in our thoughts and prayers and may you all get back home safely to your families. May God Bless each and everyone of you. I am an American who is from Scottish and British decent. But even if I weren't I would be so proud of all of you. You are in my prayers and thoughts night and day. This war is a war for freedom. Freedom for others. Your selflessness and courage shines throughout the world. What you are doing is an inspiration to all people everywhere who thrust after freedom. God Bless each and every one of you. May God keep you safe and return you home soon to all those who love and cherish you. I’m a Scottish-American, and a former US Marine. The training I received at the hands of the Royal Marines served me well in Viet Nam, so I’m confident you’re all capable of doing a great job and I’m proud of all of you. To all the Scots, Brits, Australian, and American forces, “Bless ‘em all” and Semper Fi. I am a descendant of the McEwens from Dundee. In 1679, the McEwens joined with others in an uprising against the oppressions of their time. I am proud of my heritage now more than ever before. You are willing to go to war, not to fight for your freedom, but for the freedom of a people who cannot fight for themselves. May the Lord hold each one of you in His arms and return you safely to your families soon. The Lord promised in Micah 4 that one day all weapons of war will be done away with and His people will live in total peace. May that day come to us soon. As a Canadian, proud of his Scottish heritage, I am greatly disappointed in the Canadian government's position not to support coalition forces in Iraq. Like many thousands of Canadians who believe our government made a tremendous mistake, I send my family's prayers and best wishes to all the troops involved in the Iraqi theatre of war. May God rid this world of tyranny and bless you all in the process. It is with regret that my government has decided not to support the allied forces in the gulf. However being a Douglas / Munro I am following with great interest and pride the activities of the Scottish, and Australian forces. 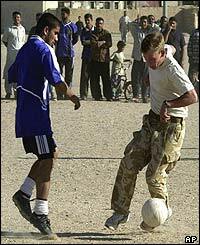 The Scots actions at Basra swelled me with pride when the got between the civilians and the enemy. To all the armed forces of the Australian, UK. and US. I am an Aussie of Scot/Eng. ancestry, who is proud of our boys and girls who are in Iraq, trying to free the people of that country from a dictatorial government. These oppressed people need our help and love to overcome many obstacles. God Bless our armed forces and bring them all safely home. May we all cherish the freedom that we take for granted. 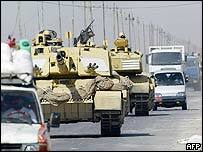 Hundreds of British tanks and armoured personnel carriers are pouring into the southern Iraqi city of Basra. The 7th Armoured Brigade, the Desert Rats, have stormed the city with several thousand troops in an attempt to take it over and secure it. Three units, the Royal Scots Dragoon Guards, Royal Fusiliers and the Black Watch, have advanced into the city, meeting only "isolated pockets" of resistance, correspondents say. The airport has also been secured. The dramatic push follows days of caution while the mood of Iraq's second biggest city and its defences were assessed. I'm a Canadian of Scottish descent - I believe with all my heart that if our Prime Minister was also of Scots descent rather than French, we would be in the thick! Chretien's French blood does not do him, or our country, proud at this important juncture in history. The majority of Canadians (75% of Canadians outside of Quebec, and in Alberta the numbers seem to be far higher - those who do NOT support the Coalition are beginning to take cover under their respective rocks) favours supporting the US and Britain in this conflict. The US has been our friend,our ally, our defender and our big brother for almost two hundred years. The British Empire is at the root, the very heart of our country, our culture, and has been always our guiding light. Of course there have been many and myriad influences since our humble beginnings, and all these influences have their place in our society. But as a country, we must always remember our foundation and honour that. Canada was originally French and British. Chretien does no honour to his French roots when he cowers ~ he only emphasizes to the world that this is the way of the French - to play ostrich until it is time for someone to rescue them. This is NOT the way of Canadians ~ we stand on guard. I'm certainly not ashamed to be a Canadian, but I AM ashamed of the cowardly actions of our PM and his government, and very embarrassed by and for them. I am offering my apologies and my utter and complete backing to the Coalition forces and all who support them, on behalf of the many, MANY Canadians who did not (or wish they did not) vote for our current government, and for the many more who do not agree with their position. Chretien is retiring soon (not soon enough! ), and will be leaving a very unfortunate and short-sighted legacy for himself - that of a coward and a fair-weather friend to his friends and allies. Whether he chooses to believe this or not is irrelevant ~ he WILL be remembered this way. I, among many, many others will actively campaign against any diplomatic posting/UN ambassadorship that he may covet. Cowards should not be rewarded. Personally, I have nothing against the French or French-Canadians as a whole, but they must realize that on the world stage, they are being perceived as cowards because of their actions (inactions) of the entire 20th century, and if they don't wish for the world to continue to have this perception, then they are the only ones who can change it. Step up to the plate, France and Quebec. Don't scurry, whine and hide. Stand up for what is right ~ don't allow terrorists & despots to exist ~ ZERO TOLERANCE. Stand up for freedom ~ whatever happened to "Liberte, Egalite, Fraternite"? You had the right idea 200 years ago ~ what sucked the water out of your knees?? You led the way, and then fizzled...........come on, you have more staying power than that, don't you?? Don't depend on the rest of the world to rescue you ~ there may come a day when that is no longer possible. And to all those Quebecois separatists ~ be careful what you wish for. There may come a day when you wish you had the West as your defenders when some foreign invader comes knockin' at your door ~ you certainly won't be able to count on France ~ they've shown that they are not the best baby-sitter. After 200 & some years, though, why do you need a baby-sitter? Can you not be a part of Canada as an adult, & not an extension of France? We gave up Britain as our ruling country a LONG TIME AGO (that is why we can honour her traditions without rancour) ~ join us in the 21st century. Join us in the fight against terrorism & injustice. Join us in trying to make the world a better place. If you choose, however, to let terrorism, anarchy, bigotry, injustice, hatred, poverty, disease, tyranny, and hunger continue, then do nothing ~ that's all it takes ~ your goal will be accomplished. That one's easy. It's easy because one doesn't have to DO anything. If no one makes any effort to make things better, then the above is what we end up with. Choose to make this world a better place ~ it will only benefit our children and our grandchildren. British forces can move freely through 'the majority' of Iraq's second city Basra after a major assault by thousands of troops, military commanders have said. By Sunday evening, most of the city, with the exception of the old town, was understood to be in British hands - although sporadic fighting was ongoing. Major General Peter Wall told the BBC there was still some "small pockets" of resistance, and "renegade elements" could well stage counter-attacks throughout Sunday night. BBC correspondent Nicholas Witchell, at coalition headquarters in Qatar, said officials believed the operation was a great success. They told him Basra had "tipped" past the critical point and they were "nearly" in control. "They feel they can finish off the job in the next few days," he said. 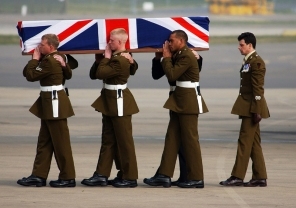 Three British soldiers died during the battle for Basra, the Ministry of Defence confirmed. Among them was Fusilier Kelan John Turrington, 18, of the Royal Regiment of Fusiliers. The other two have not yet been named. 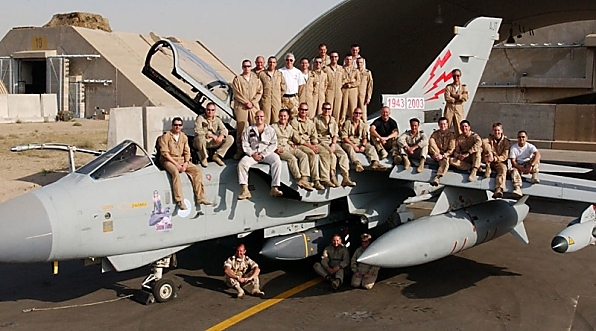 Our prayers and deep thanks are with and for all the coalition defence forces in Iraq, they are brave and doing a job that has to be done - please finish off the terrible ruling regime in Iraq and set the Iraqis free. I am so proud of the courageous men and women fighting in Iraq, especially those with whom I share my Scottish and American heritage. May God bless and keep each one, and may peace and stability soon come to Iraq and the whole region. To the families and friends of those who have sacrificed their lives in defence of freedom, my sincerest sympathy, and I pray that God will give them comfort and support as they bear their grief. There's nothing profound in this message of mine, but what the troops are doing in Iraq is profound -- changing the course of history by confronting evil, even though so many others have been critical of the effort. "What is right is not always popular, and what is popular is not always right." Thank God that President Bush, Prime Ministers Blair and Howard, and the other leaders of Coalition nations have the vision and courage to do what is right. British paratroopers are pushing in large numbers towards the centre of Basra's "old city" in an attempt to tighten their grip on the area. This follows a major assault within the city overnight during which three British soldiers died. 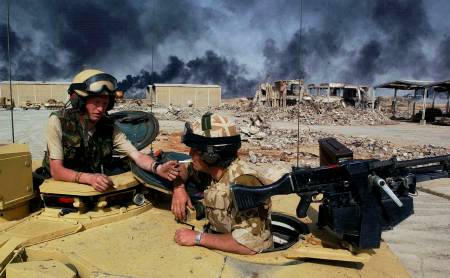 Defence Secretary Geoff Hoon said the UK troops in Basra had achieved a "tremendous amount" and were "there to stay". Meanwhile, a British Army spokesman has said Iraq's southern commander Ali Hassan al-Majid - known as Chemical Ali - has been found dead in Basra. The reports have not been confirmed. Members of the Third Parachute Regiment are heading in large numbers for the old city, according to a British Army spokesman. BBC correspondent Ben Brown, travelling with 3 Para, says that "minimal" resistance has been encountered so far. The narrow streets in Basra's old city may present a major challenge to British forces, with the possibility of heavier Iraqi resistance. The BBC's Hilary Andersson said: "They will be storming the old city on foot. "It is in the old city, which is an area of narrow alleyways, it is thought by British forces that most of the remaining Iraqi fighters are holding out." A presidential palace in the city had been seized by Royal Marines with little resistance, said the BBC's David Bowden. Mr Hoon said he was "enormously proud" of the British troops in Basra. "They have moved into the heart of the city. They are now in Basra to stay. They have done a fantastic job." he said. Iraqi commander Ali Hassan al-Majid - who is Saddam Hussein's cousin - is reported to have been killed in an air raid on Basra two nights ago. He ordered a poison gas attack which killed thousands of Kurds in 1988. Hilary Andersson said that if he was confirmed dead, it might leave resistance in Basra "incoherent". One of the British casualties to die in Basra was named as Fusilier Kelan John Turrington, 18, of the Royal Regiment of Fusiliers. The other two fatalities will not be named until their families are informed. 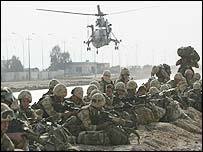 British troops, with 95 tanks and 80 Warrior armoured vehicles, are in the south, west and north of Basra. A British Army spokesman said that "scores" of lightly-armoured vehicles had begun to progress towards the old city. Group Captain Al Lockwood, British forces spokesman, said the narrow streets of the old city made it difficult to enter using tanks. But he said that residents were helping by pointing out where militants were hiding. He said: "There's just this one area we need to clear out and then Basra will be liberated." 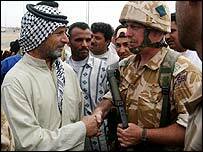 He said that the British advance into Basra had been met with "jubilation" from Iraqi civilians. Colonel Chris Vernon, said British forces have pushed to the Shatt-al-Arab - the city's main waterway. He said it could take up to four days for troops to gain "strict control" of Basra. He told BBC News: "It will take three or four days before we can firmly say we have both territorial and indeed strict control of Basra." GEORGE Bush delivered an unprecedented message of support to Scottish service personnel fighting in Iraq yesterday. In a signed letter sent to The Scotsman from the White House, the president of the United States said he and his country were "deeply grateful" for their contribution to the liberation of Iraq. The message was timed to coincide with yesterday’s annual Tartan Day celebration in New York, with parades, marching bands and parties designed to mark Scottish-US relations. This is the second time Mr Bush has given such public backing to Tartan Day, but he broke from convention to deliberately refer to the war in Iraq and to the efforts being made by Scottish members of the armed forces. 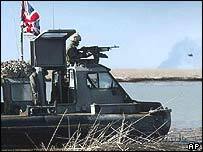 The Black Watch infantry regiment, the Royal Scots Dragoon Guards tank regiment and 45 Commando, the Royal Marines, have played key roles in securing the area around Basra, while RAF squadrons 617, 11 and 12 from Lossiemouth and Leuchars have flown daily sorties against Iraqi positions. Mr Bush said he wanted to send greetings to all those celebrating Tartan Day and to recognise the crucial role that Scottish immigrants had in shaping US society. "Among the most important of these contributions have been efforts to establish and uphold the cause of freedom," he said, citing the influence the Declaration of Arbroath had on the US Declaration of Independence. "This legacy continues today, as the United States joins with a broad coalition of nations to advance freedom and defend the peace of the world. We are deeply grateful for the contributions of the many brave Scottish men and women who are fighting in this noble cause." Tartan Day, established in 1998, takes place every year on 6 April - the day in 1320 that the Declaration of Arbroath was signed. The request to engage came over the commanding officer’s radio. A moment’s pause, and then the reply crackled back: "You are now clear to engage the bunker with four men with HESH and co-ax." High explosive shells and chain gun - that’s what the jargon meant, and nothing could stand in their way. Inside the bunker, the militia had only a few seconds left. The sound of a dull explosion rolled across the city. Over the radio, the Challenger crew reported the kill. "The target was engaged and the job was done." In the thick of the action, Lt Col Riddell-Webster was directing the fighting. 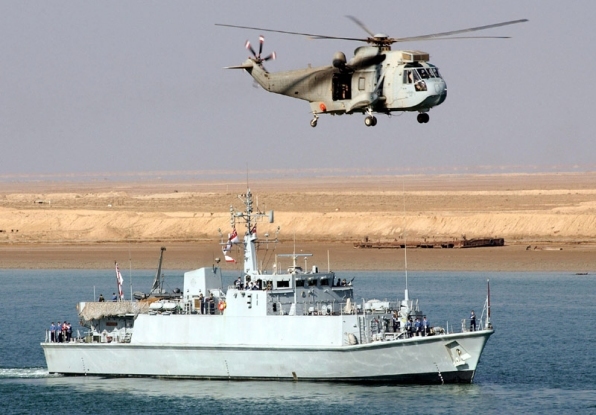 Egypt squadron and B company were racing towards the military compound which was intended to be their prime objective for the day, south-west of the Al Jubaylah area of the city near the docks on the Shatt al Arab, the waterway leading down to the Persian Gulf. A Challenger reported tanks destroyed - a T59 and a T55. "We’ve engaged and destroyed another T55," said the disembodied voice. The other units took heart from their success, but there was much more to be done. There was a lot of civilian activity, they said: "We’re taking a lot of small arms fire." "We’ve engaged a section-strength unit. They have gone back into the shanty town," they reported. "Four Cobras on station - they are going to sweep our station and our objective and then we are going to lose to and two will stay on," a voice on the radio said. And another voice: "We’re still taking small arms fire, we’ve identified the base plate." But there were still hazards to be negotiated. Be on the lookout for more mines, they were warned. "Some mines have been cleared and there is a route through but be careful as you go through," a voice told them. The CO’s voice came over the radio. "Given the congestion on the route, are you able to push forward?" he asked the units which had been holding the forward positions. Then came the news that the Cobra was down. "Hit by direct fire, we’ll possibly have to go forward to rescue the pilot," said the voice of the battalion commander over the radio. "One Cobra has just landed on the road, it’s now blocking the road. A Cobra is attempting to put down on the road. He’s stopped bang in the middle." The CO’s voice chipped in: "We’re going to have to get it shifted." He called for a low loader to be brought forward to move the stricken aircraft. By 9am, the Iraqis were on the run, resistance falling away. "We've just cleared the building on the far side of the compound," Egypt company reported. The soldiers were out of their vehicles but there was little opposition. They were setting up base there, but the CO already had his eyes on the dockyards. Other units were also advancing across the city, reports coming in from all sides of victories and resistance falling away. New targets were selected, units given grid references for Baath party headquarters, military installations, Fedayeen buildings - all identified as targets. On the Basra side of the Cobra, a crowd of more than 500 people had gathered. Some of those at the front were carrying cans of petrol, but whether to use it to attack the troops or simply to scavenge fuel was not clear. "What have you got to contain the situation?" the CO asked. The whole operation to take the city was being brought forward. There was still some resistance - one tank had to fire its chain gun at another to remove a determined cluster of Iraqi defenders swarming over it - but it was being pushed inexorably backwards. On the road into the city Major Hall was surveying the damage to his Cobra. "We were doing armed reconnaissance for your guys because they had been taking machine gun fire and grenades, and then we got shot," he said. "You couldn’t see anyone shooting. There were plenty of people walking the streets but someone was in a building shooting at us. "You can’t go in shooting at the bad guys with all the good guys around. I think they were just punters with guns who happened to have a good day. "It’s a shame because there were a lot of people down there waving at us." He was probably travelling at 130 knots when the bullets hit. "They nearly got my co-pilot, there are shots in my blades, but it kept flying well. The tail rotor was blown almost in two but it stayed together and we had a fire in the cockpit," added the major. "The first thing that went through my mind was ‘Where are the Challengers?’. I didn't want to land anywhere else." It was six or seven minutes before Major Hall could put the Cobra down. He said: "We were very lucky, the good Lord smiled on us today." Columns of vehicles were pouring into the city, clusters of people by the roadside waving at them as they passed by. Children waved and gave the thumbs-up, women carrying buckets back from the filthy, stinking water at the edge of the city stopped and waved. This is just a small note to say how proud I am of all the soldiers from our country fighting for the cause of freedom. I hope that they all come home safely, and for those who don't, my deepest sympathy to them and their families. The government of Saddam Hussein has lost control over Baghdad, with the advance of US forces into the centre of the capital. US tanks drove unhindered into public squares on the eastern bank of the Tigris for the first time, including the area surrounding the Palestine hotel, where the international media are based. As word spread, people began congregating in the square in front of the hotel. 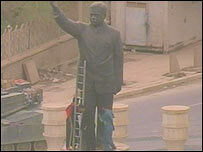 The largely calm crowd is trying to pull down a huge statue of Saddam Hussein with a rope and a sledgehammer. The BBC's Paul Wood, at the Palestine hotel, says there is only around 500 metres of the city still nominally under the regime's control. US Central Command has "added Baghdad to the list of places the regime does not have control", spokesman Vincent Brooks told reporters at the daily Central Command briefing. Among the buildings seized by US marines were the headquarters of the security police, Reuters news agency reports. US marine Sergeant David Sutherland, speaking to BBC News from the square in front of the Palestine hotel, said that gunfire could be heard on a half hourly basis coming from the northern part of the city. 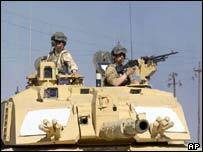 Central Command has emphasised that some Iraqis may still be prepared to fight to stop the US advance. There has been no sign of the officials who have until now dealt with the media on a daily basis. Our correspondent says that all those in authority appear to have fled, leaving a potentially dangerous power vacuum. 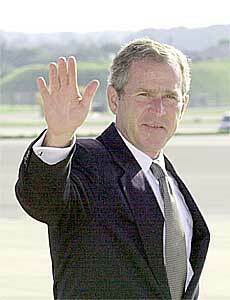 The day began with cheering Iraqis greeting marines arriving in the Shia stronghold of Saddam City. However, Paul Wood says that the response in the central area is more cautious - where the affluent population fears the arrival of looters. I have lived almost half of my life in Israel. My wife is Israeli and our daughters were born and raised in Israel. Indeed my eldest daughter is now serving in the IDF. I too am no stranger to a tour of duty on the west bank and in Gaza. I have no wish to prompt a discussion on the Israeli / Palestinian conflict, a complex affair to say the least. 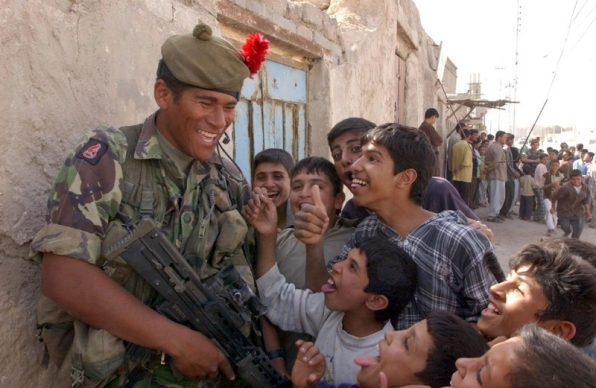 I would however, like to make clear my appreciation, admiration and absolute pride in the Scottish soldiers now serving with typical distinction in Iraq. As a Scot and Canadian Citizen, I was very disappointed in our Prime Minister not to support America, Britain and Australia. To all the Men and Women who are in Iraq, doing a great job in the support of Freedom, I would like them to know, there are millions of Canadians who support you. We thank you and God Bless. As Operation Iraqi Freedom unfolded and I saw the deployment of UK forces; I suspected that there had to be Scots in there somewhere. Later I learned that my expectation was true. Where would the UK be today if not for the Scots and Irish who took on the most dangerous missions. And more importantly where would the U.S. be today if not for this same fighting breed? In the war for American independence there were Scots on both sides of the battlefield. The Scot and Irish blood has driven America through every conflict of war, through every achievement of social, economical, educational, and industrial development. Those of us who realize this, are most thankful. We are proud of those who were willing to stand by us in this unpopular task. And though the media may give much fanfare and focus to US troops advancing and liberating Bagdad, Mosul and Tikrit, we know that those advances would not have been possible had it not been for the bravery and expertise of the forces that held Basra in check, eliminated the enemy in Basra, and restored order and relief to the residents of Basra. My sincere thanks to the people of Scotland and Ireland for the participation of their sons and daughters. May God bless and protect them and return them safely to their homes. THE Prince of Wales has written a moving personal letter to Lieutenant-Colonel Tim Collins, the British commander whose historic eve-of-battle speech to British troops has made him a household name. The letter, sent from Charles’s Highland retreat of Birkhall, described the oration as ‘stirring, civilised and humane’, and congratulated the colonel on ‘the highest traditions of military leadership’. It arrived on Good Friday to the joy of the colonel’s men, the 1st Battalion Royal Irish Regiment, who fought their way farther north than any British troops and are now peacekeeping on the Iran-Iraq border. The colonel won worldwide acclaim for the speech he delivered to his 800-strong battalion as they prepared to cross the breach into Iraq a month ago. His belief that ‘we go to liberate not to conquer’ and his order ‘If you are ferocious in battle remember to be magnanimous in victory’ galvanised public opinion in Britain and America. As much a plea for compassion as it was a battle cry, the oration was unplanned and delivered without notes by the 42-year-old Belfast economics graduate. At the time, the colonel said he felt that his men, although willing to fight, were troubled by the political and moral doubts which beset much of Britain. As their leader, he wished to share his own conviction in the democratic and humane rectitude of the conflict. Although his letter of congratulations from the Prince is unprecedented, it is not, perhaps, surprising. For Charles, a former Naval officer and commander-in-chief of many regiments, is a staunch defender of British military tradition. Like the Presbyterian colonel, whose tone was biblical in parts, he is deeply religious and prays daily. Finally, both men share a fascination for the Muslim religion and Eastern culture, which they believe enrich rather than threaten the Christian West. In his speech, the colonel made it clear to the men of the Royal Irish, which includes a company of Gurkhas as well as soldiers from nations as diverse as Fiji, South Africa and Australia, that Saddam and his Ba’ath Party were the enemy, not Iraq and her people. As such, he said, the troops should respect the culture and antiquity of the Gulf state once it was under Allied occupation. Most poignantly, the father of five, while preparing his own battalion for death in their ranks, also demanded they treat fallen enemy soldiers with dignity and bury them in marked graves. He told his troops: ‘The enemy should be in no doubt that we are his nemesis and that we are bringing about his rightful destruction. There are many regional commanders who have stains on their souls and they are stoking the fires of hell for Saddam. ‘He and his forces will be destroyed by this coalition for what they have done. As they die, they will know their deeds have brought them to this place. Show them no pity. ‘It is a big step to take another human life. It is not to be done lightly. I know of men who have taken life needlessly in other conflicts, I can assure you they live with the mark of Cain upon them. If you harm the regiment or its history by over enthusiasm in killing or in cowardice, know it is your family who will suffer. You will be shunned unless your conduct is of the highest, for your deeds will follow you down through history. We will bring shame on neither our uniform or our nation. ‘Iraq is steeped in history. It is the site of the Garden of Eden, of the Great Flood and the birthplace of Abraham. Tread lightly there. You will see things that no man could pay to see and you will have to go a long way to find a more decent, generous and upright people than the Iraqis. ‘Don’t treat them as refugees for they are in their own country. Their children in years to come will know that the light of liberation in their lives was brought by you. Charles’s response to his stirring words, which in Britain have been described as ‘Churchillian’ and in America likened to the Gettysburg Address, arrived on cream-coloured paper bearing the green crest of Birkhall. It begins and ends in the distinctive, scrawling handwriting of the Prince, and bears his trademark underlining of words he wishes to emphasise. The other day my attention was drawn to the address you made to your Battalion before the conflict to unseat Saddam Hussein began and I asked to see as much of the transcript as possible. For what it is worth I just wanted you to know how profoundly moved I was — and I know many others were too in your extraordinarily stirring, civilised and humane words. What you said somehow encapsulated, in a brilliantly inspired way, everything that we have come to expect of our Armed Forces and demonstrated why, quite simply, they are the best in the world. But what was so moving, and so deeply heartening, if I may say so, was that you totally understood the nature of Iraq and her people and the need, above all, for respect if the peace is to be won. A SMALL United States community has rallied behind Scots troops in Iraq by dispatching messages of solidarity to Edinburgh. The Royal British Legion Scotland headquarters in the city yesterday received more than 100 unexpected notes of support from residents of Shelby in Michigan, 25 miles north of Detroit. The short letters have amazed the RBLS, which now hopes to send them to the 2000 Scottish troops based around the southern city of Basra. The messages were sent after a Shelby woman launched a campaign to boost support for the Scots. Neil Griffiths, spokesman for the RBLS, said he was delighted with the notes, which he said showed the level of respect for Scottish troops. “The British forces, especially the Scots, are famous in the US. 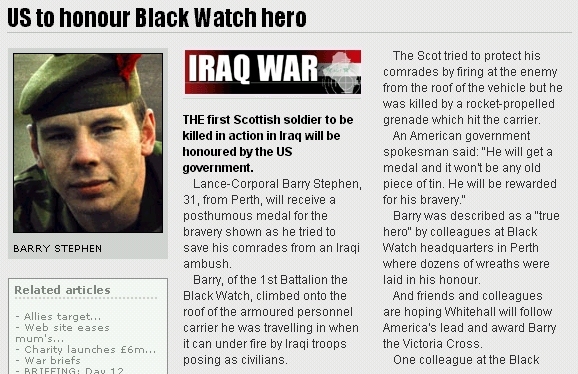 The Black Watch, who have been heavily involved in the action in Iraq, have a very high profile in America. “They have had extraordinary support. The letters say how proud they are of the British forces and, in particular, the Scots for fighting alongside the United States. The letters accurately reflect the respect and affection for Scottish troops.” The messages of support were organised by Shelby resident Christine Dearlove, a retired dental office worker, who was touched by the courage of the Scottish troops. The 59-year-old said she fell in love with Scotland while visiting the country in the 1980s when she also struck up a friendship with a retired RAF pilot in Musselburgh, corresponding with him regularly until his death in 2000. She said she sent the letters to the Royal British Legion Scotland as she believed the organisation would know where to send them to in Iraq. The short notes which feature the US Stars and Stripes flag, were written by a range of Shelby residents. A spokeswoman for the Army said: “We are delighted the support for the Scottish soldiers has extended across the Atlantic. “It is a real morale-booster and I am sure all the lads will be grateful for the letters. It is good to know that the people realise how important is the work they are doing. She said there were around 2000 Scottish troops in Iraq at the moment made up of 800 soldiers from the 1st Battalion The Black Watch, and a similar number from The Royal Scots Dragoon Guards. The remainder were from the Scottish Territorial Army, she added.